My Favorite Red Beans and Rice Recipe Now for Instant Pot - JP loves LIFE! 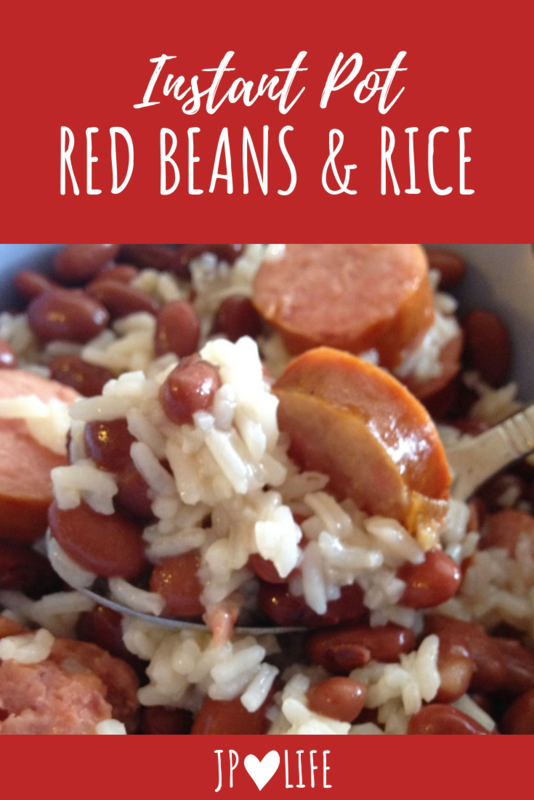 A few years ago, I shared the crock pot recipe I use making red beans and rice. When I got an Instant Pot (electric pressure cooker), I wanted to keep flavor and ease and see if we could make it faster. My friend Chef Alli converted it into an Instant Pot recipe for red beans and rice. This week, when I mentioned making it, I realized I never shared the Instant Pot version and thought some of you may want it. Red beans and rice are a great staple in the South. Not until I made some for friends in the Midwest did I realize lots of people here are unfamiliar with it. I forget people don’t know that we make it with a bunch of sausage and it is definitely a full meal. While I eat it all year long, it really warms me on a cold winter’s day. You’ll need to get all the ingredients together. One of the pieces I love of this is you can keep most of them on hand so you can whip it up when needed. That really paid off for me last weekend as everyone else in St. Louis was fighting for bread, milk and eggs. This needs none of those ingredients! Turn the saute mode on and put a bit of oil in. I typically use shallot flavored cottonseed oil that I wrote a cottonseed oil post on Hundred Percent Cotton about & that I gave as Christmas gifts! Cut the sausage into 1/4 inch medallions. Once the oil is hot, add the meat and brown to help add a depth of flavor to the dish. Didn’t have that option with the crock pot! Add half of the beans, then top with meat and remaining beans. Lock Instant Pot / Electric Pressure Cooker lid into place and choose manual high pressure setting for 5 minutes. When timer sounds, use a 5 minute natural pressure release, then a quick pressure release to remove all remaining pressure. You can cook the rice however you ike, but I love the ease of the Instant Pot (or rice cooker). Here are the directions for cooking rice in the Instant Pot. Place 3 cups chicken broth into Instant Pot; add 2 cups long grain rice and stir to combine. Lock lid into place and choose High Pressure setting for 3 minutes. When timer sounds, use a 10 minute natural pressure release, then a quick release, if any pressure happens to remain in pot. Fluff rice as you serve. I love Chef Alli & this recipe!